I think the golden years are when you start to think about your legacy not in terms of wanting people to love you, but that they know unequivocally how very much you loved them. Being a parent is a funny thing. When they are small you tell them, “I love you”, every day and they look up at you, snuggle into your neck and say in a voice that could melt icebergs, “I wuv you too, Mommy”. But you can’t tell them that you can’t imagine life without them; that you lie awake worrying about unseen and unspeakable dangers not just in the present, but for every day to come; that you stand by their beds just to hear them breathe. They wouldn’t understand. When they are teens you tell them, “Love ya, kid” and, if you haven’t crushed every dream of theirs on that particular day by asking them to do something they don’t want to do, they will smile a smile that lights up your whole world and yell over their shoulder as they head for the door, “Love you too, Ma”. You can’t tell them that you can’t imagine life without them; that you lie awake waiting for the front door to punctuate their arrival home, worrying about unspeakable dangers outside that door. They wouldn’t understand – and would definitely be creeped out a little knowing that you sometimes breech that inner sanctum of adolescence, their rooms, just to hear them breathe. As they enter adulthood, you tell them, often by phone or some other sanitized long distance version of communication, “I love you” and they know you do, and answer, “I love you too, Mom”. But you can’t tell them that the time you left homemade tuna macaroni salad in the refrigerator for them and they left you a voicemail at work thanking you, that you saved that voicemail for 3 years while they went off to college and deployment overseas. You can’t tell them that you cannot imagine life without them – ever. You try to hide the tears of parting each time you say goodbye lest they think you are dying or something. You can’t tell them that you heard them say your name in your sleep one night so clearly that you had to resist the urge to call them at 3 AM just to be sure they were ok. They wouldn’t understand. And then they have children of their own. And they understand. During the American Revolution there was a teenager named Elizabeth Raymond, who lived with her parents and sister and brother in New Bedford, NY, where her parents ran a tavern. Elizabeth’s father was a member of Clan Raymond of Scotland where he had married her mother, a member of the Ruthven family. He and his bride emigrated to the colonies, settled in New Bedford and raised their family. During the war, he and his wife traveled to New York City to buy supplies. Elizabeth, her sister and brother stayed at home with an African couple to mind the tavern until her parents’ return. Early one evening, the children heard thieves stealing the family’s chickens. Elizabeth found a gun and fired it into the night. The thieves, it turned out, were British soldiers, who fled when they heard the shot, thinking they had been discovered by a nearby contingent of the Colonial Army. The shot did bring the American guard so the British did not return. The next day, General George Washington and his party, among them a Capt. James Pardee, came to the tavern and dined on some of the chicken. Pardee complimented young Elizabeth on her bravery and quick thinking and laughingly remarked that he would return after the war and marry her. In the same spirit she replied, “Come on!”. Well, he did, and they did. James and Elizabeth Pardee had 12 children. Their daughter, Elizabeth (1785-1848), had a daughter, Olivia in 1817. Olivia married Jacob Seamans Robinson and had a son, Charles, born 1851. Jacob was captured during the Civil War and died at Andersonville Prison, July 27, 1864. Olivia, faced with the challenge of raising her young family alone, eventually became a toll taker on a highway. Her life is a story in itself for another day! Charles Louis Robinson had a daughter, Margaret Elizabeth. Margaret married Norman Nelson Alger and had a daughter,Norma, in 1911. Norma Alger Smith was my paternal grandmother. The pot in which that fateful chicken dinner was cooked, was about a foot in diameter and for many years was passed down in the family. The last known owner was Mary Susan Gerow, granddaughter of James Pardee Jr. and Elizabeth Raymond Pardee. Although no one knows what happened to the pot, the story that went with it has been passed down from generation to generation to us. I supposed Grandmother must have told me the story at some point but so far as I know it was lost until I found it while helping my father sort through family keepsakes during a visit shortly before he passed away last year. Also in the papers was James Pardee’s family history. James was the son of Ebenezer Pardee, baptized in 1699 in Connecticut. Ebenzer was the son of George Pardee, born 1656 in New Haven Connecticut. George owned a ferry in East Haven, CT. George was the son of George Pardee born 1624 in England. So that means he must have come to the colonies sometime between 1624 and 1656. That George was the son of Rev. Anthony Pardee, who was baptized 7/17/1591 at Pitminster and Taunton, England, and his wife, Anstice Cox, baptized 6/25/1587, married 5/3/1614. So – for my children and grandchildren, this is your family history too. We are very fortunate that Grandmother took the time to do the research and also that we not only have the public records of births, deaths, marriages and baptisms, but we also have these stories that make our ancestors “real” for us. That is a real gift. Post Script: Recently I visited with a dear cousin who was kind enough to gift me with a couple of items from the family homestead in West Amboy, NY (the same farm from which came the vinegar jug, milking stool and candle mold). One of the items was this curious old three legged pot, encrusted with years of soot and seasoning from untold meals cooked over an open hearth. A curious little pot . . . about a foot in diameter. I took the morning off yesterday to take Mom to one of her doctor’s appointments, so I was “home” at a time of day when I normally would be in the city working. As I pulled out of my little fifty-home neighborhood onto the main road, the surveyor working in the intersection waved to me. 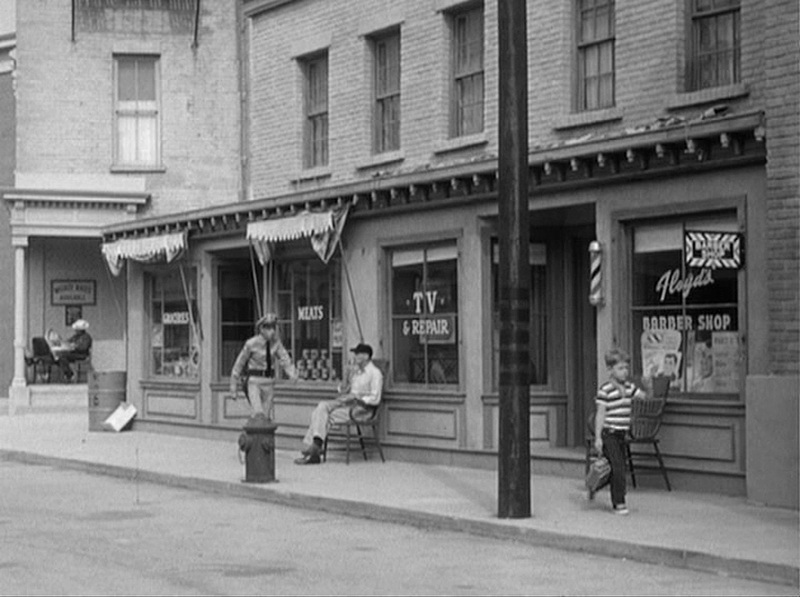 Mental note: Lone surveyor – not a highway crew of eight, six of whom are standing around drinking coffee and talking. I pulled up in front of the Village Offices to drop off our water bill payment. The sign on the door said CLOSED so I got out to ask the man sitting on the front steps of the old bank building which now houses the offices, when they would open. I’ve seen this man around town many times and it turns out one of the few black men in our rural upstate community is a Vietnam veteran who, like many veterans over the years who suffered from various mental and physical scars of their service, lives in a group home just up the street. 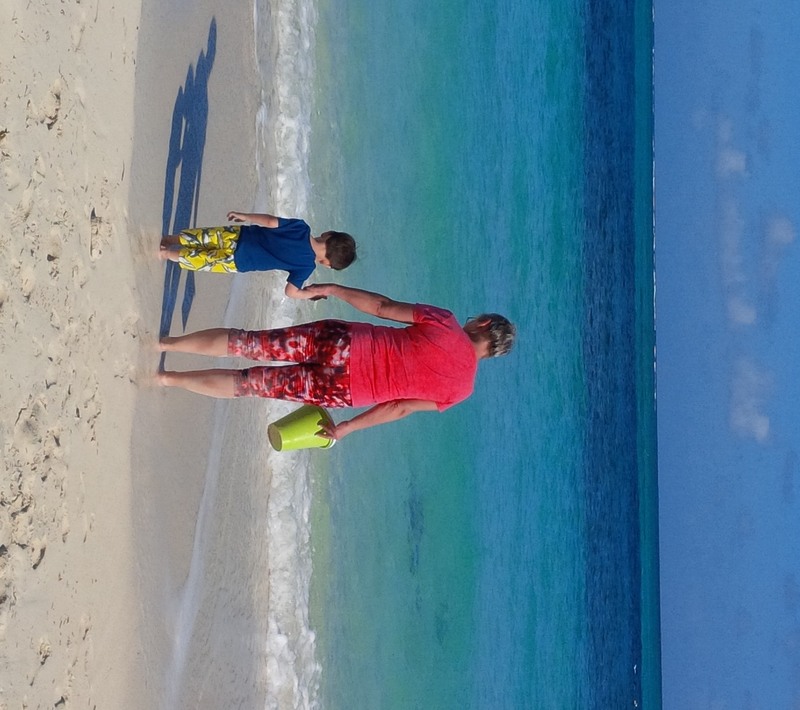 He says he likes living here better than any place he’s ever lived because the people are friendly and we have everything we really need right here, as long as we reach out for it. Well, there’s my attitude adjustment for the day! We passed the next five minutes chatting until the lovely lady who is our clerk realized she had forgotten to flip the Open/Closed sign and the two of us outside had a good laugh because neither of us had thought to actually try the door. On my way to pick up Mom I passed a grandma pausing in her walk to allow her stroller-bound charge the opportunity to smell and touch lovely flowering bush along the way, Gary of Gary’s Hots opening up his lunch wagon across from the plant, and the usual suspects headed into the diner for the weekly old farts’ breakfast. At the her appointment, one of the nurses asked about my grandbabies and Mom’s physician spent a good 15 minutes with us inquiring as to the quality of her life and helping both of us adjust to her changing needs and concerns. Since he is also my and my two brothers’ doctor, he is in a unique position to advise the family. I dropped Mom off at her apartment complex afterward and headed out of town. As I watched a boy of about twelve, fishing pole and bait can in hand, his curly chestnut hair sweat matted to his face, peddling his bike down to the creek, I thought for sure I heard whistling. Kevin says if something has an exotic name, I’ll like it. Ok, maybe that’s a little true – but only because I’ve learned the coolest things I never heard of, simply because the sound of the name intrigued me enough to explore further. This is especially true with foods. Like Lahm Lhalou – an Algerian lamb stew with almonds prunes and dried apricots. I’ll share later, I promise. 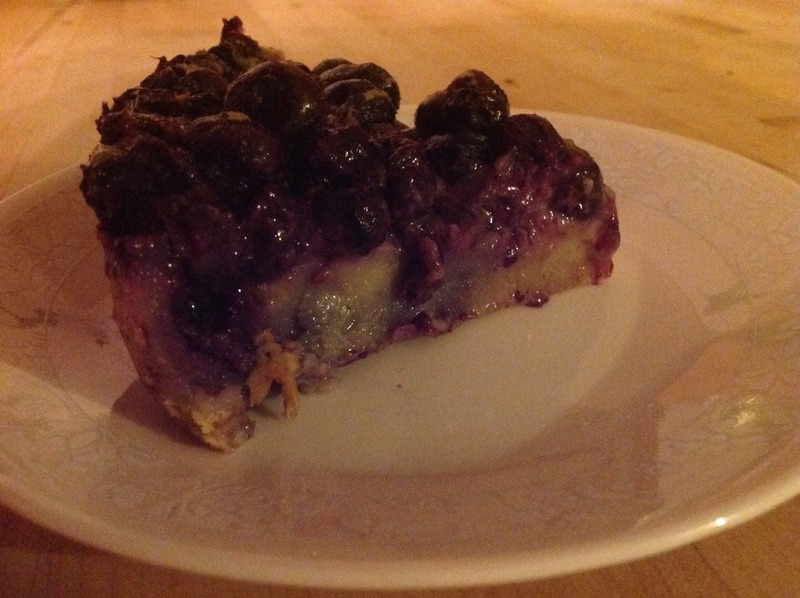 I don’t remember where I first read about clafoutis. Maybe I was looking for a cobbler recipe, or a rustic tart. Maybe I was reading an article about Julia Child, who was fond of them. Clafoutis are rustic French fruit desserts that are a cross between a cobbler, custard and pancake. 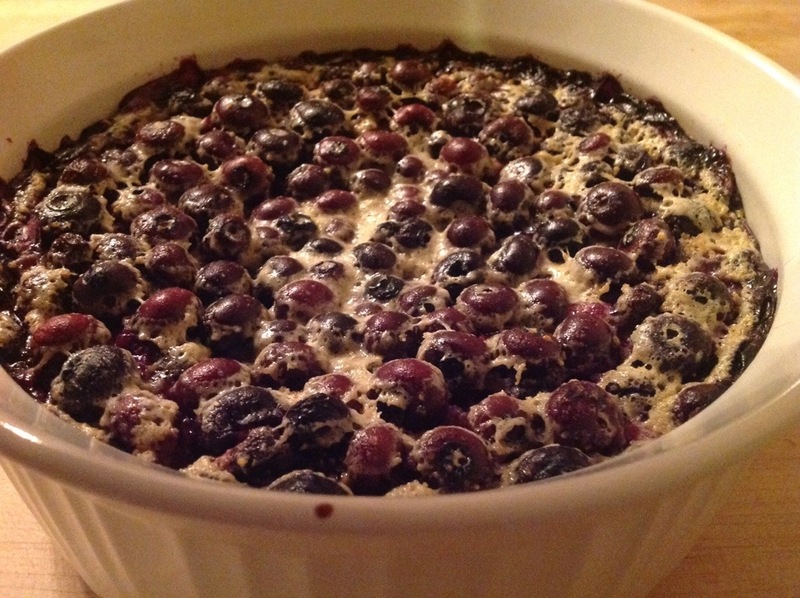 I have a favorite easy cobbler recipe but I had a lot of blueberries to use recently and thought I would try something different. 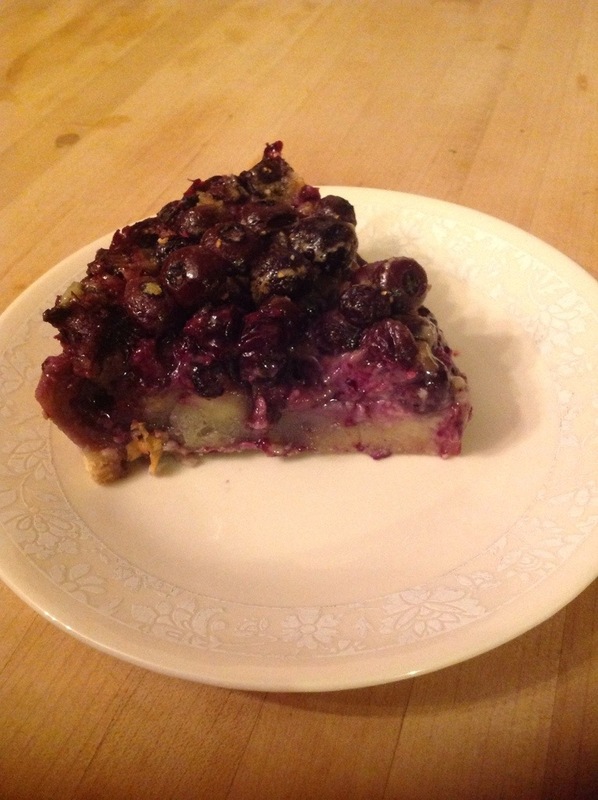 Clafoutis are easy, have common ingredients, AND it has a cool sounding name! 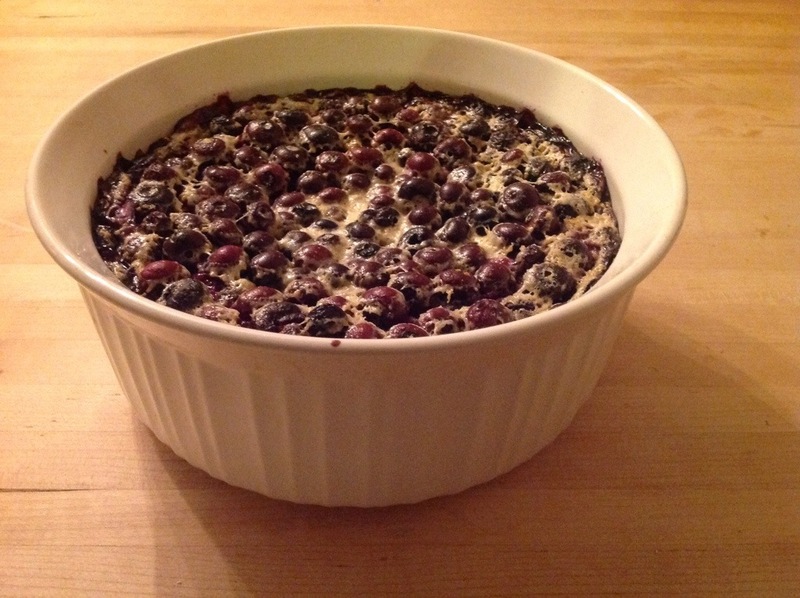 Grease a 9″ baking dish with butter and assemble ingredients: 1 pt. 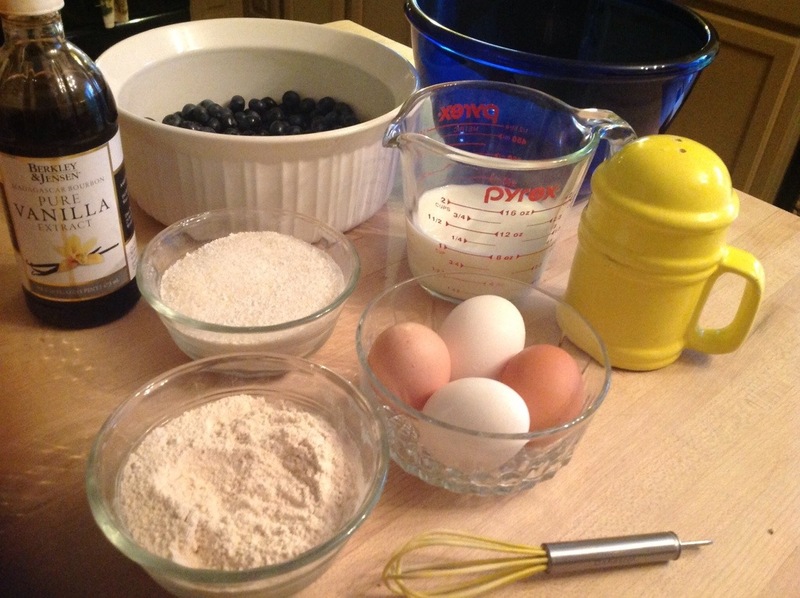 blueberries (or cherries, raspberries or other fruit), 3/4 c flour (I used King Arthur Unbleached White Whole Wheat Flour, http://www.kingarthurflour.com/shop/items/king-arthur-white-whole-wheat-flour-5-lb, which I am now using almost exclusively instead of all purpose white), 3/4 c. Sugar ( I used 1/4 c each organic raw sugar, 1/4 c refined white sugar and 1/4 c. Stevia), 4 eggs, 1 tsp vanilla, 1/8 tsp. salt and 1 c. Milk. Pour your fruit into the greased baking dish and preheat oven to 350 degrees. Whisk the eggs until light and frothy; add sugar and continue whisking until slightly thickened. Stir in milk and vanilla. Gradually whisk in the flour and salt but don’t overdo it. 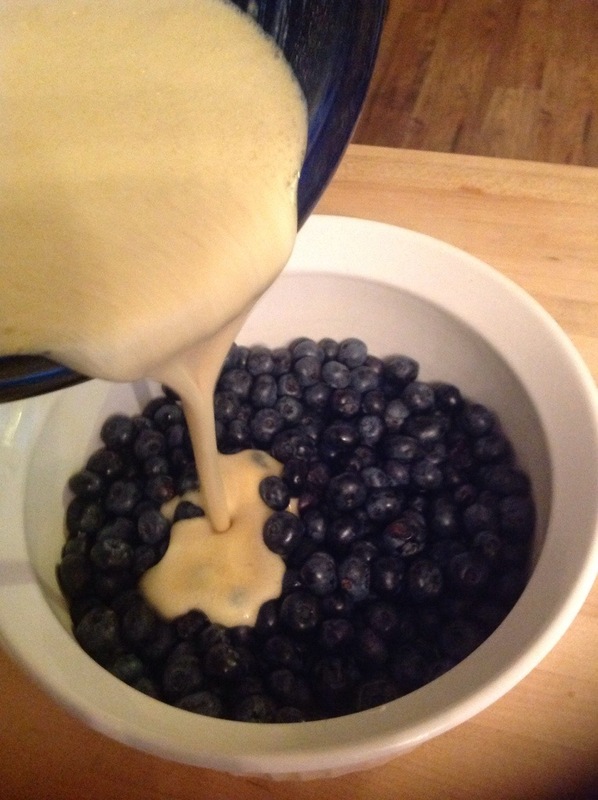 Pour the batter over the berries. Do not stir. Bake for 45 minutes. Sprinkle with confectioners sugar – or not. We dug into ours as soon as I snapped the finished dish. Serve warm. I’m thinking it’s eggs, milk and fruit so it should be good for breakfast, right?